Each year a few old friends and I take a long cycling trip over the last bank holiday in August. This year the group had expanded to six cyclists, all kitted up and ready to ride from Crawley station on the Thursday. Having all disembarked and assembled at Crawley, we took the cycle route down to Brighton. It was hot and sunny, perfect weather for cycling, although the constant proximity of the cycle path to main roads was hard to ignore. 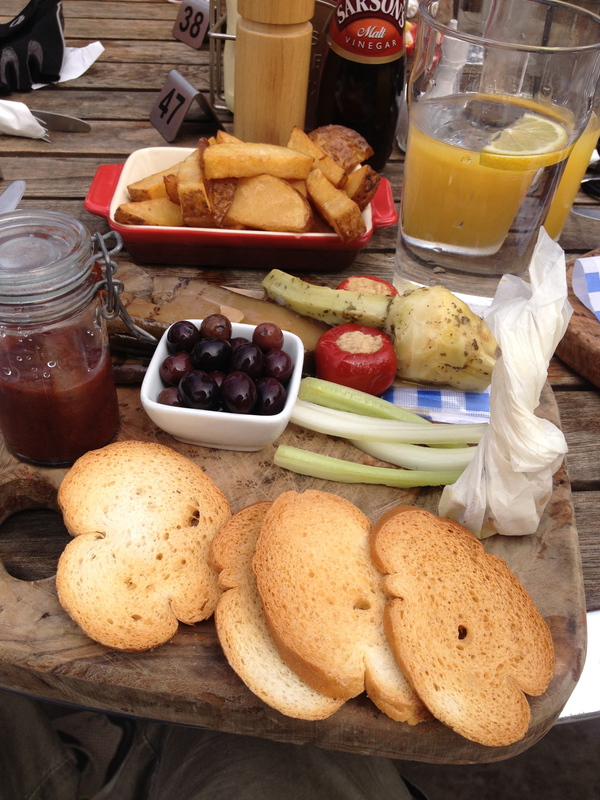 Once in Brighton – a vibrant city full of independent shops, cafes and street food vendors – we stopped for lunch. At Pret a Manger (a national chain of sandwich stores, which is considerably less French than its name might imply). Before we had left London, Dave had managed to lose his helmet and cycling gloves in Victoria station. There ensued a slight diversion while Dave re-equipped himself at a local bike store, we topped up on essentials (‘essentials’ in the context of these trips is usually water and flapjacks, malt loaf or bananas) at the nearest corner shop. No sooner had we refueled and we were off, setting a decent pace along the seafront until we started to hit the hills between Brighton and our first hotel in Eastbourne. The route joined a main road, frequented largely by people who had clearly never seen bikes before. At one stage an ape barely packed into the passenger seat of a Ford transit had to swing open his door when driving past in order to growl some incoherent bile in our general direction. Fortunately the cycle path cut inland, off the main road, and we were free from the savages before they deemed we should be burnt at the stake. If ever you need an inner tube changing, Jon’s your man. The cycle trips have been running for four or five years now, and as such have built up some traditions. One of the traditions is that Jon gets a puncture. Following a stretch cycling along at a decent clip, Jon’s inner tube pretty much exploded. Despite a valiant attempt to patch it up and carry on until we reached the hotel, the damage was too great and Jon had to re-change the inner tube. 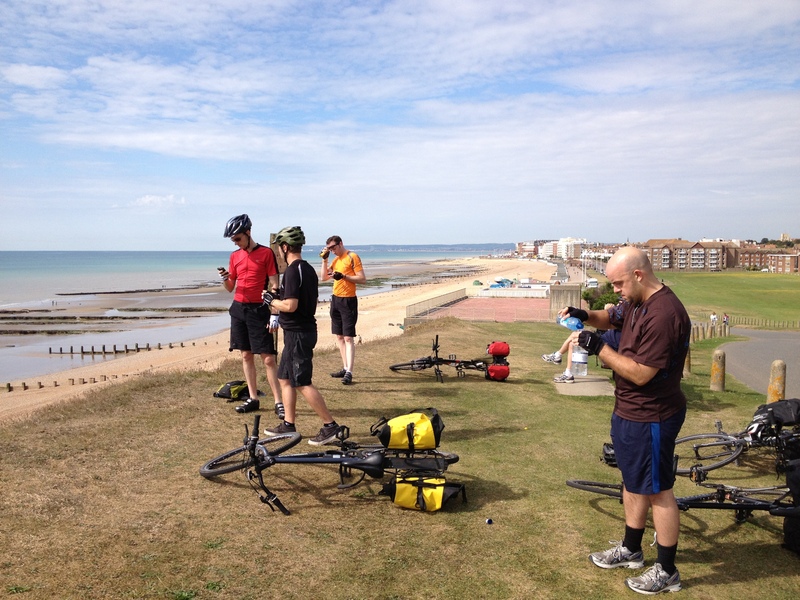 Eventually we arrived in Eastbourne, after what felt like a long day’s riding. A total of 62 miles covered, and in good time for a couple of beers and some well-earned food. The next day looked bright and sunny. We hit breakfast hard (fuel, it’s all about the fuel) and then found the local bike shop to top up on essentials. Essentials in this context ranged from inner tubes to me getting a spare pair of baggies since I had naively packed for summer and there was – we were told – a storm on the way. Loaded up, we hit the road, heading out of Eastbourne via the promenade bike/rollerskate lane. A substantial portion of the morning was spent bombing along flat seafronts and marshlands. In less than an hour we reached our first break point, where we found a space to sit at the crest of a small cliff and watch a paraglider skillfully ride the updrafts in the sunshine. He landed and gathered his parachute ready to launch himself again a bit further off. After exchanging a few words with our group he muttered something about getting some airtime in before the storm hit. iPhones were checked. Thunder was forecast. Heavy rain from 3pm. We were in for a drenching. Swinging back on to our bikes we looked eastwards at the horizon. Barely a cloud in the sky. Tasty nibbly food, aka. bike fuel. Once lunched, we were back on the road. Clouds were gathering, and as we wound through the flat lands around Folkestone it looked suspiciously like we would end the day on a climb. The road cut inland towards the coast, but our hotel was up a small-but-punishing climb after another 62 miles. Despite all the threats, it hadn’t rained. Glad to be off the intrusive seating arrangements of our bikes, Dom and I headed up to our room for cups of tea and to raid the complementary biscuits. After the lengthy process of easing weary limbs and cleaning off a day’s worth of sweat, we headed out to the local Italian where carb loading was the order of the day. The next morning we gathered downstairs at the breakfast table. It had rained overnight, there was a strong wind rattling at the windows and there wasn’t so much a threat of heavy rain as a promise. Waterproofs were donned by those who had them (ahem, I opted for a long-sleeve breathable top…), we made a functional stop at Tesco and then we were off, rocketing down the hill, plunging towards our next destination. Except after a mile we’d lost the cycle path. We circled a bit before we found it again, and then we were off… up a hill and at a much more modest pace. The first few miles of the morning were a tough climb, winding through back streets and then up to a path that ran along the edge of the cliffs that stood between us and Dover. The clouds were low, and the rain drifted in sheets across the headland. We could barely see 20 metres in front of us. When the wind hit us from the side we were blown from one side of the path to the other. Then, on leaving the side of the cliffs, the path dropped inland. With the wind to our backs we tore towards Dover, satisfyingly passing cars queueing on the A20 for the ferry. But what goes down must come back up again (the universal law of cycling, which seems to run counter every other physical law). Dover is fairly well-known for its cliffs, and these were mounted via a series of steps and with a narrow ramp. Less than ideal with a heavily laden bike, but it wasn’t the most challenging climb of the day. Pizza served on a flooring tile. As Dom said, presumably if anyone used a pizza cutter the whole thing would just snap in half. As we carried on, the weather got better and the sun came out. The wind remained with us, and where it had once been behind us, it came to be a nasty headwind that sapped speed. We stopped for lunch at a place that served pizzas on flooring tiles (among other dishes, not served on materials purchased from Wickes) and the other Jon changed a puncture on his bike. How we all chortled that the curse of the puncture was clearly restricted to Jons. The next few miles after lunch were relatively quick and largely on-road. The path cut through a wooded park. As we were maneuvering our bikes through the gates out of the park I heard a suspicious noise coming from my front tyre. Within seconds it was flat. The curse was now no longer restricted to Jons. After a bit of faffing, I had found a small piece of glass that had made its way through my tyre. This was promptly expelled, the inner tube was changed, the wheel was pumped and then we were off. And then I remembered that I had forgotten to tighten the quick release on my wheel. I screwed it up and caught up with the rest of the group. We came into a heavy-going and seemingly interminable climb through a wooded stretch, the wind largely in our faces. Then we were heading back downhill, and along a river leading to Ashford. I kept on slipping to the back of the pack and being left behind. I seemed to be suffering in the wind and my legs felt like treacle; I had to switch down a gear set, and even that felt like I was in top gear. After something like 10 or 15 miles we reached the outskirts of Ashford and stopped to get our bearings. I figured something wasn’t right with my bike, so tried to spin the wheels independently. I span the front wheel and it stopped dead immediately. The brakes were rubbing on the wheel. This explained a lot. I straightened out the wheel and checked that it span freely and everything got a whole lot easier. We reached the hotel later than we had hoped, so any option of making the most of the hotel spa was out of the window. Hot baths and showers all round, followed by a few pints in the bar and some rather late dinner. The next morning – the final day of the trip – we feasted on the prodigious breakfast provided by the hotel. Fried egg, mushrooms, hash browns, tomatoes, toast, beans, fresh pineapple, prunes, a cinnamon whirl and a seeded muffin were all washed down with two pots of coffee. The day was advertised as being just 45 miles, but since mileage had been hit and miss on the previous days we made sure we had plenty of energy for the day ahead. Which was just as well. Signs for the route 18, which we were due to follow for most of the day, were elusive. Before long we had lost our way and added an extra six or seven miles to our journey, alongside two intense climbs. We passed a sign welcoming us to the Kent Downs. The Kent Downs weren’t the problem, it was the Kent Ups we could do without. 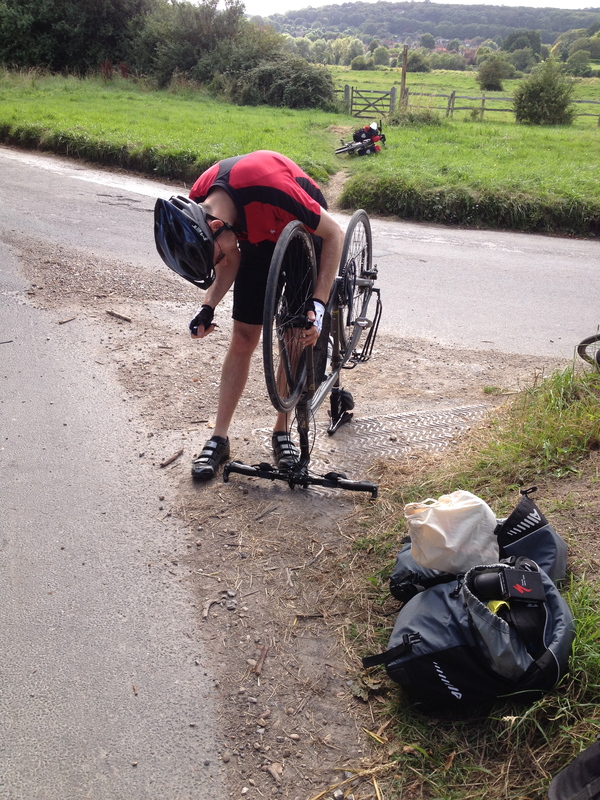 In a spectacular act of poor fortune, both Jons suffered simultaneous punctures. Dave’s chain fell off in sympathy. We waited in a field for the group to reassemble, all the while wondering where we would find lunch. The proposed stop of Kilndown seemed miles away, and with poor signing it was feeling unlikely that we would ever get there. Once regrouped, we set off again. We had learnt that Sustrans love nothing more than to mark a turning midway down a fierce descent when you want to be making the most of gravity’s support. The eagle-eyed amongst the group managed to save us a few missed turns and eventually we rocked up at The Globe and Rainbow at 2:45. Their kitchens had shut, but because we looked pitiful and they were generally awesome, they re-opened for food to take our orders. 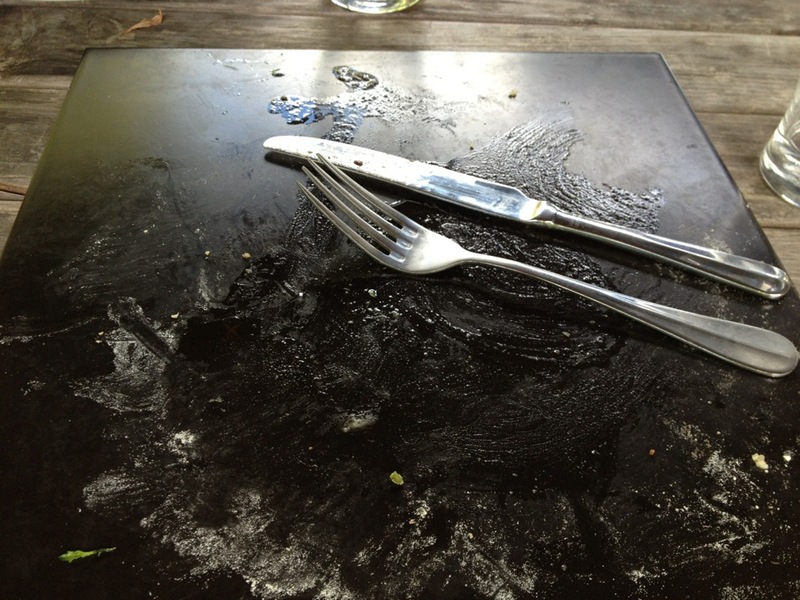 The food was gooooooooooood. With the promise of another 15 miles of up-and-downhill before we reached our final destination of Tunbridge Wells, we steeled up for the final slog and were pleasantly surprised when it turned out to be closer to 10 miles. Despite a short circuit around the centre of the town while we tried to find the station (which had been well sign-posted from the city outskirts, but get into the centre and any mention of it just vanished), we managed to arrive with the next train due to depart in 15 minutes’ time. Once back in London and on the final seven miles home, having cycled through 245 miles of largely beautiful countryside with largely friendly locals (barring the Transit ape), and along quiet roads, the number of suicidal pedestrians stepping off pavements and into my path took some getting used to.